A simple and classic homemade crumpet recipe topped with a simple ricotta topping. 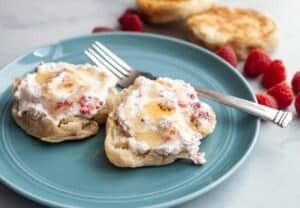 A great lazy brunch or snack with tea! 1) For crumpets, stir together dry ingredients in a medium bowl (this recipe is easily doubled by the way). Add in water and stir to combine. The dough will be very wet. 2) Let dough sit for 10-15 minutes to bubble a bit and activate the yeast. 3) Meanwhile, mash fresh raspberries lightly with a fork and stir them into the ricotta mixture with honey and zest. Set aside for later. 4) To cook crumpets, lightly grease and heat a large, sturdy skillet over medium heat. Once hot, drop in crumpet dough into about 1/2 inch thick circles. You can use a metal ring if you want perfect circles but I just eyeballed it. You should get 4-5 large crumpets from your dough. 5) Once the crumpets are in the pan, turn the pan heat down to low and let the crumpets cook slowly for 15 minutes. 6) Flip the crumpets and cook for 15-20 minutes on the second side until they are lightly browned, crunchy on the exterior, and cooked through. 7) Let crumpets cool slightly and then serve smeared with ricotta topping. This delicious recipe was brought to you by Macheesmo. Read the full post at https://wp.me/pkSYO-adS.